Harmony Murphy Gallery is pleased to present LIFEFORCE, a solo exhibition of new work by artist Josh Callaghan. Though observation and imitation of nature the two bodies of work on view in LIFEFORCEserve as a metaphors for the impulse to make an imprint on the cosmos though art. Inspired by the warped surfaces of mirrors found in bathrooms of public parks, pools and other municipal settings, lining the gallery walls are a new series of Metal Paintings. Repeatedly defacing, cleaning, rubbing, scratching and scuffing, Callaghan invents a narrative of use and wear to form a revelatory patina. The hard stainless steel surfaces recall the utilitarian aesthetic of spaceships, both real and imagined, as machines for living in the extreme conditions of space. 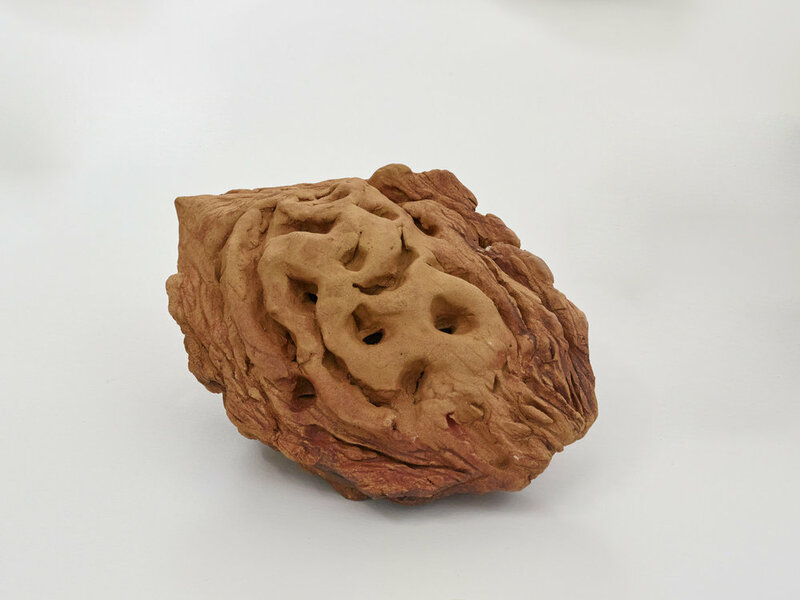 Accompanying the paintings are excerpts from The Nut Cycle, an ongoing project by the artist to examine walnuts and other natural forms in sculpture. 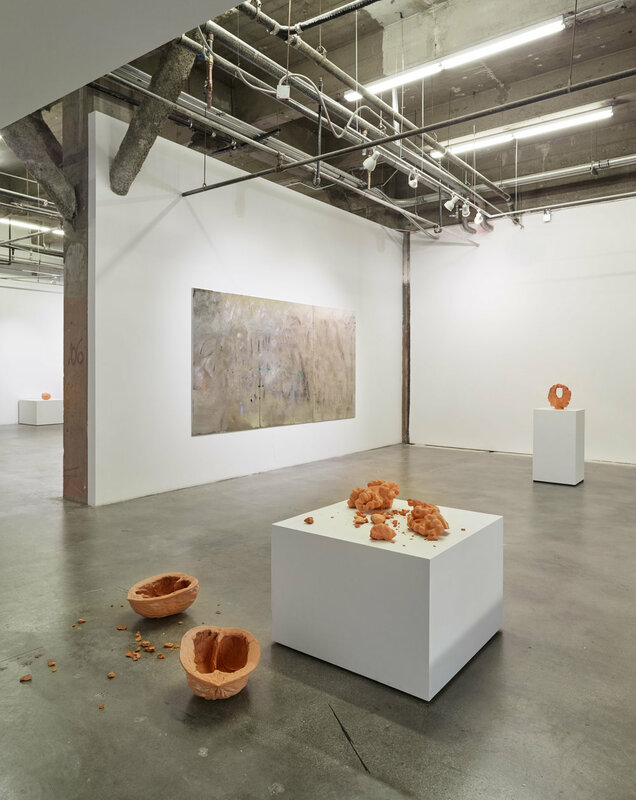 On view are a series of oversized ceramic peach pits. Referencing in scale the size of a human baby, these sculptures present an allegory for artistic creation as a version of parenthood. As the seeds of the fruit, the pit contains all the potential energy for rebirth. They also illustrate an artistic lineage between Callaghan and his father Mike Callaghan, a master ceramicist whose biomorphic forms are alluded to in the artfully rendered ridges of the pits’ surfaces. 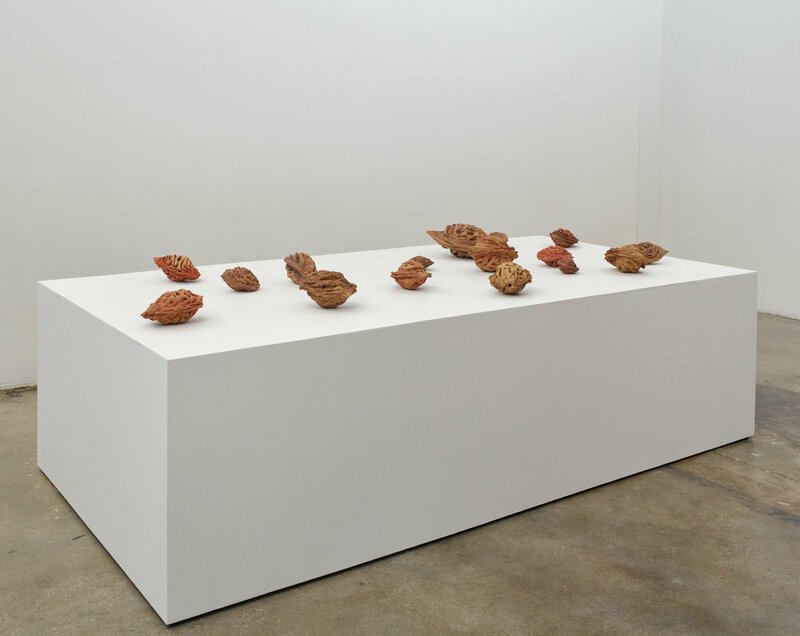 Magnifying his humble inspiration, Callaghan provides a new way of considering the complexity and strangeness of something most throw away without a thought. In conjunction with the exhibition, we present Harmony’s Gift Shop; a store featuring objects by Callaghan’s friends and collaborators. Participating artists will include: Michael Dopp, Chanel von Habsburg-Lothringen, Lisa Sitko, Kathryn O’Halloran, Skylar Haskard, Melissa Huddelston and Benjamin Lord, amongst others. Joshua Callaghan (b. 1969 Doylestown, PA) holds an MFA from University of California, Los Angeles and a BA in Cultural Anthropology from University of North Carolina at Asheville. He has had solo exhibitions at Harmony Murphy Gallery, Los Angeles; Steve Turner Contemporary, Los Angeles; Haas & Fischer Gallery, Zurich; and Bank Gallery, Los Angeles. Group exhibitions include Current LA:Water, Public Art Biennale, Los Angeles, CA; After Effect, Ballroom Marfa, Marfa, TX; Made in Space, Gavin Brown’s Enterprise, NY and Night Gallery, Los Angeles; Bienal Del Sur en Panama, Panama City, Panama; and Frieze Sculpture Park, Frieze New York.